Since I’m at the 2 week mark, I tested my fasting blood ketones this morning. The result: 0.7 mmol. I’m relieved by that number. Phinney, Stephen; Volek, Jeff (2012-06-15). The Art and Science of Low Carbohydrate Performance (p. 91). Beyond Obesity LLC. Kindle Edition. The optimal zone is around 1.5 to 3.0 millimolar, but I’ve read that it can take up to a month to get there. I’m going to do a few more fasting tests before Monday, then also test after my Saturday am run. Granted, that run is just a 5 mile recovery with 6 100m strides, but it’s the most I’ll be doing before the HOA Monday. Of course I’ll test after the race too. Levels should be highest post-exercise. 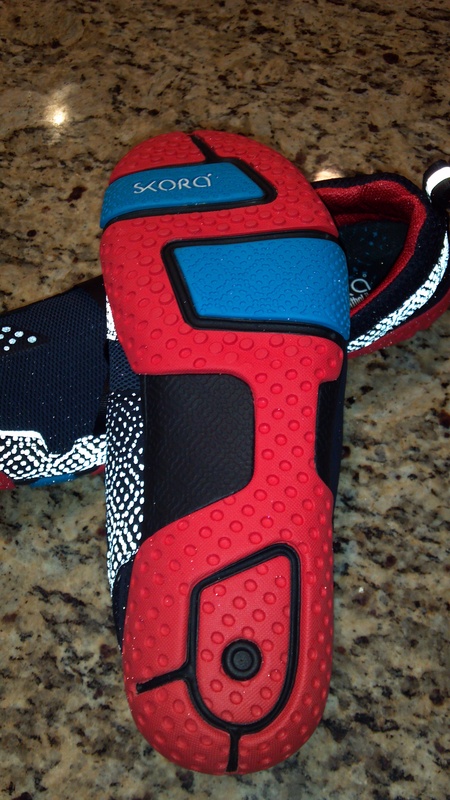 I had a great “dress rehearsal” run in my Skora Bases this morning (brain cramp – just bought my wife the Cores). I did 7 miles with Jeremy and John, 2 at race pace. Pre-dawn makes for some interesting proprioception training! I am ready to roll for the Heart of America Marathon in Columbia, MO, Labor Day. My ketogenic experiment is going well. I seem to feel a bit sluggish starting out on runs, but once I get going, I am not having any problems. I am experiencing a little more thirst than usual upon waking. The 2 week mark is today, and I am going to test my fasting ketone levels tomorrow morning. I am going to be encouraged if I break 0.5. That is the threshold for nutritional ketosis. Boston Marathon registration procedures were announced today. The big news is that the field will be significantly expanded, as expected. I hope this means that the secret unpublished qualifying standard (allegedly roughly 1:30 faster than BQ last year) won’t move all that much as a function of both increased supply and increased demand. I hope I will be ok – I’m 3:57 faster than the standard. Am I off it? Time will tell. My research into electrolytes and optimal carb loading during the marathon has led me off in an unexpected direction. Nelson has been quoting and recommending Prof. Tim Noakes for some time – mainly his seminal work “The Lore of Running.” I started following him on Twitter a while back, but recently became intrigued by a linked podcast where he was interviewed on the HFLC/LCHF (I’ve seen it both ways, c’mon people let’s pick one) High Fat Low Carb Diet. I also picked up his book “Challenging Beliefs” which has several chapters on the subject and uses the more cumbersome term “high-fat/high-protein/low-carbohydrate diet.” I’m going with HFLC. I decided to launch into it Thursday evening. There was a fairly short and fairly mild acclimatization period. My only symptom was a light headache (to be expected from what I read) on Friday. I felt great on a long run Saturday with 12 sub-7:30 miles on my way to 16. It was a depletion run – nothing but water. There was no bonk like I had experienced a couple of weeks before on an attempted depletion run of the same distance. My Sunday morning recovery run found me about 0:30 faster than usual – I struggle with a decent pace on this run although I realize it doesn’t need to be that fast. With any luck this means my body has happily switched over to using ketones for fuel. I’m still researching what to do during/before a race. Ultramarathoner Timothy Allen Olson eats this way. I am looking forward to listening to a podcast interview with him on the way home today. I figure he’s fairly credible since he won the Western States 100 in 2012! [EDIT: and 2013! Wow. Article with podcast link predated WS 2013.] Wish me luck! The Electrolyte Debate: What to drink during your marathon? I’ve previously dabbled in the alchemy of finding the magic elixir of running. Look for a future post on my weird marathon carb-loading regimen (I use the Western Australian method). I’ll also probably write one about what to eat on race morning, so I am excluding those subjects from this post. I have fought to push GU down during my previous 4 marathons. I just can’t seem to stomach it at race pace, although I don’t have nearly the problems others note. This, coupled with a recent depletion run bonk, caused me to rethink what I should intake during a race. There is a significant debate out there over hydration, electrolytes, and calories during a run. Disclaimer: I am not a doctor, and I don’t even play one on tv. So, take all this with a grain of salt (or don’t, more on that in a minute). I am not going to plow any new ground here. I’ll lay out the basics, give you my conclusions, and pose a few questions along the way. I’m interested in what works for all of you though – what have you tried? My main sources for my conclusions here are “Advanced Marathoning” and “The Paleo Diet for Athletes.” There are 3 components in this equation: 1) how much fluid? ; 2) how many calories? ; and 3) electrolytes – yes/no/which/how much? (obviously the muddiest issue). #1 – Virtually everyone agrees that you need to take in some fluid during the race. Except maybe Alberto Salazar. Elites will dehydrate themselves to a certain degree during a race, but there is a point at which this becomes counterproductive. Studies show that a certain amount of dehydration does not decrease performance. You can also drink too much during a race – especially if you’re out there for a long time and are drinking only water: this condition is called hyponatremia, and it can be just as deadly as dehydration – it’s just not as well-publicized. Exactly how much fluid you need depends on your sweat rate – which varies based on the environment and you. You lose 3-4 pounds of water during a marathon on a hot day, 2-3 on a cool one. Also, your stomach can only empty so much fluid per hour. It looks to me like average consumption should be around 24-28 fluid oz. per hour. Conclusion: I’m shooting for 6 oz. every 15 min. #2 – My two main sources agree on the amount of calories you should intake during a race – basically 200-300 per hour. Conclusion: for 3 hours out there, I’m targeting 700+ calories. #3 – Electrolytes. Sodium is the biggie. AM says you need it – recommending a ratio of 250mg/L. AM specifically recommends it to avoid hyponatremia and improve caloric uptake. The Paleos don’t agree as to its benefit – but waffle on the conclusion. To be fair, I think what they are saying is that it really doesn’t help as much as we think, although on balance it seems to recommend it. Also, I think I see a flaw in their reasoning. Basically the theory is that the sodium content of your sweat is less than in your body, thus sodium becomes more concentrated in your body as you exercise and sweat so you don’t need to replace it. But…(and I didn’t go to the source study so maybe they just skipped a step) if you’re sweating out sodium and other electrolytes and drinking straight water (or something with calories and no electrolytes) during a race, that should dilute the concentration of sodium in your body, right? Duh? The Paleos admit there’s no known downside to taking in sodium during a race and may be a slight advantage – improving the rate of absorption of water and carbs – thus ultimately concurring with AM. That’s enough for me. Conclusion: a dash of salt. The AM ratio is designed to not exceed the level of palatability. I have seen other formulas with 5-6x the sodium. I tried one. It’s barely drinkable. The new Gatorade Endurance formulation boasts 3x the sodium and 2x the potassium of regular Gatorade. However, it doesn’t have sufficient calories in my estimation – 80 per 12 oz – only 480 if you drink 72 oz. It also has a lot more sodium in those 72 oz. – 1740 mg – than the AM formula would recommend (532 mg). Plus, I can make this stuff way cheaper than a $30 canister of powder, and without any food coloring. I’m going to split the difference between Gatorade Endurance and AM: 1120 mg/72 oz. On to potassium. AM and the Paleos are silent on the subject, but Gatorade includes it in their formulation. PDA does discuss it in the context of cramp prevention – but says available studies show no benefit. PDA does recommend it as part of recovery. Anecdotally, whenever I had a huge calf cramp after 2-a-day soccer practices in HS I’d make sure I had a banana or two that night. I eat a lot of bananas these days, which seems to ward off the cramps for most purposes, however I have experienced significant calf cramping in 2 of my 4 marathons. Also, one of my other sources – a Doctor/runner who passed along the World Health Organization’s Oral Rehydration Solution (“ORS” – for treating severe dehydration) includes potassium as an ingredient, but again in a fairly high concentration. Since I am not planning on suffering a bout of explosive diarrhea before the race, I’m going to compromise with a lower concentration closer to the Gatorade number of 840 mg potassium: 795 mg/72 oz. There are other electrolytes to consider, but I am not adding them to the witches brew at this time, primarily magnesium. Spinach and pumpkin seeds have a lot by the way. So does swiss chard. 72 oz. of marathon electrolyte/fuel/fluid (that’s a lousy recipe name. Maybe MEFF72? Sounds vaguely Victor Conte-ish. Maybe I should go register that with the PTO). water to fill to 72 oz. Notes: 1 tsp of dextrose has 15 cal. There are 48 tsp. in a cup. So 1 cup of dextrose is 720 calories. Dextrose aka glucose is used because it is a simple sugar – a monosaccharide – rapid absorption. It’s also more easily tolerated than fructose. Sucrose is an ok substitute, but it’s a disaccharide, so there’s a metabolic process there. You can get dextrose at a brew shop or Amazon. Sea salt is sodium chloride, obviously. 1/2 tsp. yields 560 mg of sodium. Nu Salt is potassium chloride. It’s sold just about everywhere as a salt substitute. There are alternatives, but watch out for Lite Salt that also contains sodium – then you’re doubling up. I’d really prefer 1/6 of a tsp., but who has that measuring spoon. 1/4 tsp. yields 795 mg of potassium. If that sounds like a lot, you need a lot more K per day than you do Na. A banana has over 500 mg. So I’m not worried about OD’ing on K. Lime juice is purely for flavor. I like Nellie & Joe’s Famous Key West Lime Juice. It’s the next best thing to fresh. I am going to be such a wannabe at the Heart of America marathon. I’m going to split these 72 oz into 6-12oz. bottles and have the RHSW place them at aid stations for me. The advantages of a small race! Run like the elites! I’m going to try to pick one up every half hour and drink 1/2 right away, the other 1/2 15 minutes later. I’ll start the first bottle pre-gun. I’ve tried it out once already and tolerated it well. I think it will be easier than GU to get down. I was a bit nauseous in the first few miles of the Garmin marathon. AM tells me that’s because I’m pushing harder than I should at the beginning. Well, that’s how I race. I can race a bit better than my training would predict, but not without a price. As with any “new” thing – try it before you race it. If you try it, let me know what you think! 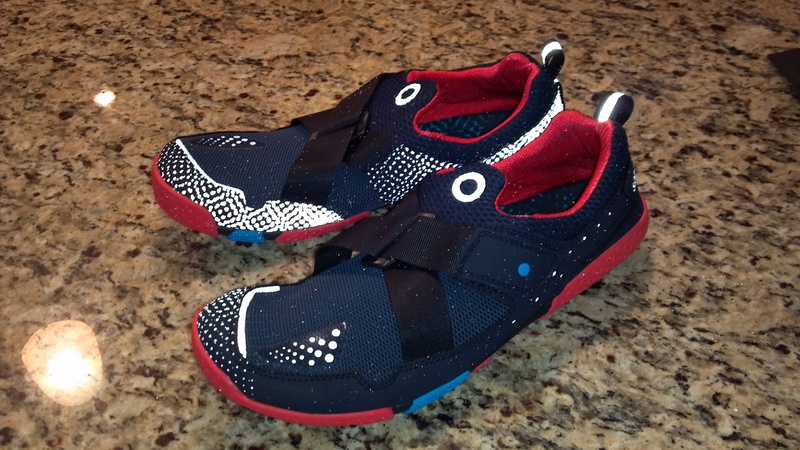 Since receiving the SKORA BASE to try out (gratis – thanks!/objectivity disclaimer) just under a month ago I’ve run in them 8 times and put about 90 miles on them. It’s an instant favorite – so much so that I’m considering running my 5th marathon in them, my return to the Heart of America Marathon on Labor Day in Columbia, MO. Quick tangent: the HOA has some great history as the 4th oldest marathon in the country. Hal Higdon won it in 1968 just after dropping out of the Olympic Trials. Easley Hill climbs 240 feet in less than a mile. By such objective measures – including elevation change and mean temperature – it might be one of the toughest road course marathons out there. To me, the ultimate test of a shoe is its overall function during a long run – anything 16 miles or more. Does the shoe interfere or stay out of the way? If I’m not thinking about my shoes while running, that’s ideal. If I come out of a long run (especially with some goal pace miles in it) without having to stop to adjust the shoe, without any blisters, and without unusual aches or pains in recovery, that’s my definition of a shoe that functions properly. The BASE functions the way I want a shoe to function. Because of my current racing goals I race on pavement. If I could race 26.2 miles through a lush field of grass, I wouldn’t wear any shoes. I haven’t found a marathon yet that’s billed as fast, flat, and well-irrigated. Thus, I think every minimalist runner is looking for the ideal level of cushioning. I do run barefoot fairly often – but (mostly) not on pavement. Concrete doesn’t really occur in nature – so I think you need some cushioning. On the other hand, you don’t want so much cushioning that you’re disconnected. I think the BASE strikes that balance effectively, especially for race tempo. In a recent training long run which included both pavement and a limestone gravel trail, I think the sweet spot surface for the BASE is gravel – but given the choice who would prefer pavement to gravel? I haven’t done a true trail run but I did try them on a surface generously described as grass (non-irrigated scrub over hard-packed clay) and loved their feel on that. My personal preference on a shoe is laces. I will say that the BASE is the best-executed version of a bootie/Velcro closure/strap upper I have come across. 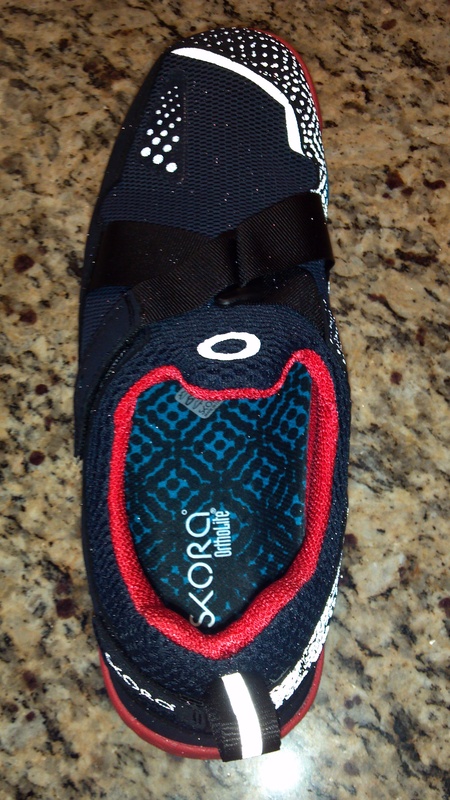 Fit is an important component in any shoe – the manufacturer has some limited control here and SKORA uses it to its advantage. A better way of putting it would be flexibility of fit. The criss-cross Velcro closures on the BASE combined with its snug but stretchy upper allow you to adjust the fit to your preference. It even has an adjustable band at the heel, although I haven’t had to futz with it since I haven’t experienced any heel slippage or tightness. 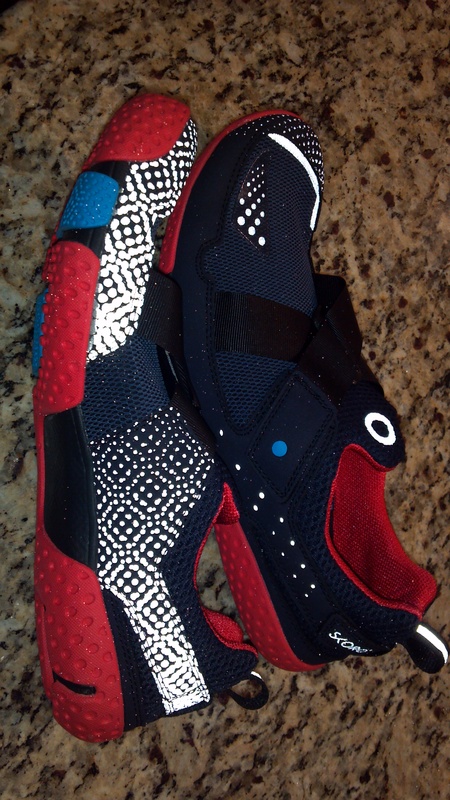 The toe box is roomy enough without feeling like you’re in a cave. I really love how the BASE allows my toes to flex and spread while keeping the rest of my foot in the shoe. As to the functionality of the BASE’s design, there are several elements I consider to be objectively superior to the design of some other minimalist shoes I’ve tried. The first is that the toe is slightly turned up. When running barefoot, no one is going to drive their toes straight into the ground – they’re slightly turned up so that the forefoot can make contact. I’ve run in some flat-footed minimalist shoes that I catch pavement heaves with – not a problem with the BASE. The BASE isn’t flat from side to side – and neither is your foot. The fancy term is that it allows for proprioception. In this context it means the shoe is letting your body do what it needs to do whilst running without interfering. If you’re thinking about it you’re not doing it – it’s unconscious. No one wants a shoe that’s going to fall apart in under 100 miles. I’ve had a few in my early minimalist days. The BASE is built to last. No discernible wear or construction issues at this point. Believe it or not, I have several minimalist shoes that have zero reflective material on them. That’s just unacceptable. The BASE lights up like a Christmas tree at night. A good subjective test for a shoe is: given your available shoes in current rotation, do you find yourself gravitating to it? With the BASE, I do – it’s easily the best multi-purpose shoe in my closet right now. I’m as likely to put it on for a tempo run as a long run. I even wore it non-stop at Webelos Camp for 3 days where it proved to be an excellent trail hiking shoe. I know this is a purpose-built running shoe, but an added bonus is that it’s one of the most comfortable casual shoes I’ve had on my foot in recent memory. Bottom line: if you are looking for a minimally-cushioned shoe that disappears on your foot – look no further. I was away on a float trip and then Webelos camp last week, so the blog has been pretty quiet. Webelos camp made my 18 mile Saturday morning long run impossible – I just couldn’t (a) leave the campsite for that long; or (b) get up early enough to be back at Reveille, 7am. So, I crammed it into Sunday morning with a 5 am wakeup call. Obviously it was dark. It would be fun to set up a “web cam” (pun intended) to capture runners doing their spider web freak-outs. I know mine would have been hilarious. And I don’t even have arachnophobia! Alternative solution: run with a headlamp. I recently purchased a set of them, but as I have blogged previously, I hate having any extra stuff attached to me. I suppose I will have to give it a try as the days get shorter, or give up the trail in the dark.